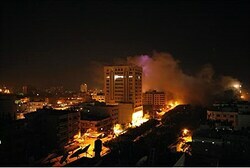 The IDF carried out multiple airstrikes Tuesday evening in the Khan Younis area in Gaza. IDF sources say the strikes hit their intended targets – a weapons factory and two tunnels built by terrorist groups. So far, Gaza media outlets have not reported casualties as a result of the attack. The airstrike came in response to a mortar shell attack this morning. Gaza terrorists fired on IDF soldiers near the Gaza security barrier. “The IDF will not tolerate attempts to harm citizens of the state of Israel,” an IDF statement said. Hamas and other Gaza terrorist groups suffered losses in the fighting, and their arsenal took a severe hit. However, Hamas managed to fire rockets on central Israel and Jerusalem for the first time. Prime Minister Binyamin Netanyahu recently noted that while Gaza terrorist groups have claimed they were victorious in Pillar of Defense, they have been unusually reluctant to attack Israel since the fighting ended. “The numbers are clear: a decrease of 98% in rocket and mortar shell fire. There’s no doubt that we obtained significant deterrence,” he said.